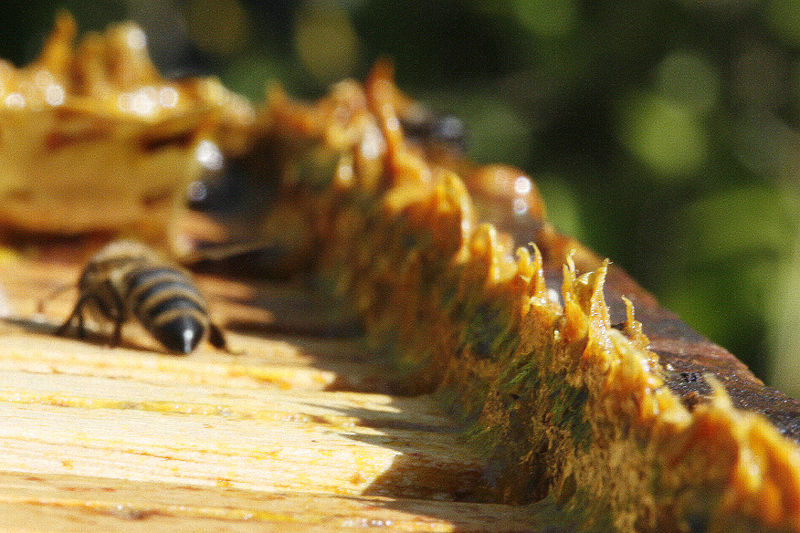 Propolis is a substance of gums and resins that bees collect from tree buds, rich with beeswax, pollen, enzymes and other substances and use it to seal and disinfect the inside of the nest. Chemical Composition: Propolis contains resins and balsams 55%, 30% wax, 10% essential oils, 5% pollen, flavonoids and phenolic compounds. Physical properties: Propolis differs from cell to cell due to the vegetation, while the color varies from red to yellow black. It is insoluble in water and soluble in alcohol .In temperatures over 25 degrees Celsius is soft, flexible and adheres to the hands, and at temperatures below 15 degrees Celsius is hard and brittle. Nutritional value: Propolis has bactericidal and bacteriostatic properties. It is used for treating traumas of the respiratory organs, the buccal cavity and other areas of the human body. Due to the high concentrations of flavonols affects the human body having antiseptic and antibacterial activity, inhibiting the aggregation of erythrocytes, protecting vitamin C from oxidation and finally improving blood circulation in capillaries. Simultaneously used against fungal infections and otolaryngology problems and to treat ulcers and prostate problems.